My trip to India was in March, a month after the intense programme of visits reported in the other posts on this blog. The purpose of my visit was to speak at CALIBER 2015 in Shimla, the capital city of the Indian state of Himachal Pradesh. Shimla is famous for being the summer capital of the British Raj, its buildings and weather familiar to anyone from the UK – it has snow in the winter, being 7,864 ft above mean sea level with breath-taking views of the Himalayas. 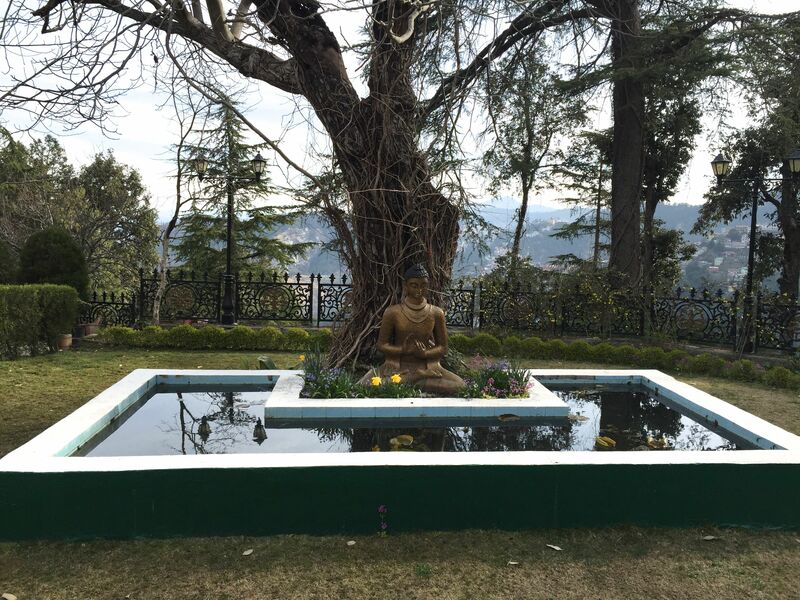 Shimla is also home to the Institute of Advanced Study in the Humanities. It was their Librarian (Prem Chand) who arranged the invitation to speak at the 10th CALIBER conference. He was one of the organisers together with INFLIBNET, the arms-length library support group of India’s University Grants Committee, and Himachal Pradesh University. I approached Shimla in the best possible way, in the rail car from Kalka that runs on the narrow track railway that climbs 2,500 feet over 864 bridges and through 100 tunnels. Unlike the Shimla Express we stopped only once, at Borag for a second breakfast of chai and an omelette sandwich. Traveling with two other invited speakers (Dr Kathleen Shearer, Executive Director of the Confederation of Open Access Repositories (COAR) and Kate Vasili from Middlesex University, who was to speak on copyright) our destination was the Summer Hill Station. We were shown wonderful hospitality as we were met and driven to our lodgings at Yarrows. I had been asked to speak about EDINA and about the role it plays in the University and with Jisc in delivering online services for research and education in the UK and beyond. For my part, I was also keen to speak about two of our activities that address challenges to the integrity of the scholarly record: stewardship of e-journal content and ‘reference rot’ in scholarly statement , the first funded at the University as a Jisc Service at EDINA, the second a project funded by the Andrew Mellon Foundation. The CALIBER organisers have been prompt in making the conference proceedings available online, so my paper, ‘What EDINA Does: Ensuring Ease & Continuity of Access’, can be found at http://ir.inflibnet.ac.in/handle/1944/1838 . My slide deck is available on request and will be deposited along with the paper in the University’s Open Access repository, https://www.era.lib.ed.ac.uk/discover . The conference began the next day with much ceremony and a delightful cultural event to start the proceedings. Many useful contacts were made during CALIBER 2015 including early discussions with Dr Jagdish Arora, Director of Information and Library Network (INFLIBNET) Centre about establishing an MoU with EDINA. I had planned three other events as part of my travels. The first was a short talk in Chandigarh, a modern city in the plains below the Himalayas that was built based on plans from Le Corbusier. En route to CALIBER in Shimla, I was given hospitality at the Guest House at Panjab University by Dr Raj Kumar, the University Librarian. Panjab University is rated as the top university in India. I gave a short talk in order to ‘sing for my supper’. My second presentation was when I returned to New Delhi after the CALIBER conference. I spoke at a seminar at the National Science Library organized by Dr G Mahesh (Head, NSL, CSIR-NISCAIR), with the title ‘Doing Smart Things With A Dumb Number’. The NSL acts as India’s National Centre in the ISSN Network with which I am a long-standing Observer. They are facing serious challenges as the number of ‘fake journals’ increases either in response to the new Gold Open Access opportunity for ‘predatory publishers’ to collect money from unsuspecting authors, or as a reaction from clever academics to India’s UGC requirement that only articles published in journals with ISSN will be counted in their research assessment exercise. My business in India came to a close with a meeting with Dr Ramesh C Gaur, University Librarian, Jawaharlal Nehru University (JNU). It was with JNU that the University of Edinburgh signed its first Cooperation Agreement in 2011. Dr Gaur had also been at the CALIBER conference where we had renewed acquaintance, having first met when we both delivered talks at the e-thesis (ETD2014) conference in Leicester in July 2014. (I had reported findings of reference rot following analysis of 7,000 ETDs with colleagues in the University’s School of Informatics.) The Librarian was keen to organise a workshop in India on the challenges for universities and research librarians in ensuring continuity of access to the ‘digital back copy’, both e-journal preservation and how to avoid reference rot, and wished me to return, either to coincide with ETD2015, which is being hosted in New Delhi in November, or at some other time between October 2015 and February 2016. I now have very many fine memories of that week in India, and a few souvenirs such as the splendid woollen Kullu Cap from Himachal Pradesh that we were all given at CALIBER 2015.